1998 was a huge year for the Maintenance of Way Department! It saw the completion of the Track 7-West project and the start of the tail track right-of-way for the Zoo Railroad. Nevertheless, 1999 promises to be an even bigger year for Our Gang and Travel Town as a whole as it will witness the first rails of the CS&CV RR outside the infamous "fence," a major milestone in the history of the Museum. In fact this will be the first time a train will operate from Travel Town into the rest of the park since the 3' gauge Crystal Springs and Southwestern terminated service in 1961. Of course there is a catch to this good news: WE NEED YOU TO COME OUT AND HELP!!!!! While we have a wonderful and committed group, many of our veterans have fallen by the wayside. At the same time we have many new members who have never tried track work before. So the call goes out to the old and new: The Zoo Railroad won't appear overnight, so consider making one of your New Year's resolutions to be to come out and help. The major track project of the quarter is the rebuilding of the last portion of the Track 6/Track 7 Crossover. This project is about half-complete and it needs to be finished as soon as possible as it is becoming an eyesore, due to its location in the middle of Travel Town. Its completion will also allow equipment to be moved back onto the newly rebuilt Track 7-West from their current temporary positions. The other major project of the quarter has been the tail track. 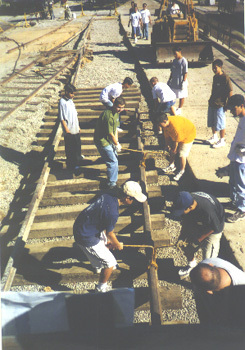 The majority of the work was done on the grading of the dirt for the right-of-way and re-alignment of the 16" gauge miniature railroad. Hopefully '99 will see the start of track construction; however, before this is done we still need to move a lot of dirt, build the miniature railroad bridge, and build a substantial retaining wall. These projects may seem mundane, but they are imperative to the construction of the tail track and eventually the Zoo Railroad. Finally, this quarter the Maintenance of Way Department became the proud owner of our first track maintenance machine. Our latest acquisition is an ex-ATSF 1968 Railway Maintenance Corporation "Linemaster," used for the lining (straightening) of track. Bob Bennett secured its donation from Cox Contracting and Dismantling in Council Bluffs, Iowa. He also arranged for its transportation from Council Bluffs to Phoenix, Arizona, to be donated by Road Warrior Transport. From Phoenix, Greg and Mike Ramsey delivered it to the park. Currently Bob and Greg are performing maintenance on it. Many thanks to Bob, Greg, and Mike for working to acquire, transport, and maintain this wonderful piece of machinery. Many thanks to everyone who helped make this quarter a productive one including Joe Barilari (M/W Superintendent), Gordon Bachlund, Jeffrey Barrow, Bob Bennett, John Daum, Andy Evans, Jim Fontenot, Charles Forsher, Nancy Gneier, Greg Ramsey, Gregory Ramsey II, Mike Ramsey, Chris Rippy, Darlene Sexton, and Doug Stephens. It is with great pleasure and satisfaction I report that the pace of work on M.177's Winton engine continues to increase at a seemingly exponential rate. It is entirely likely that by the time you read this, the engine may have been started for the first time in nearly a half-century. As of the first week of January, the cylinder heads have been applied and the rocker arms adjusted. Lube oil, coolant and fuel piping installation is complete. Installation of the ignition wiring is underway. A new safety valve for the air starter and main reservoir has been purchased and installed. A host of little problems have been "worried away," mostly by carefully searching for parts. It's a bit like a gigantic three-dimensional jigsaw puzzle. As the engine goes back together, I'll stand and stare at it for a long while, then search through old photos, and then stare for a while longer, and suddenly a light will come on and I'll realize what a particular part in the boxcar is and how it fits. This is how I found missing pipe fittings for the Engineer's foot warmer, copper piping for the oil pressure gauge and wiper motors, and various little brackets and fittings. Who knows how many more times I'll paw through the parts in the boxcar and other storage areas before it's all over. You'll probably also recall that the only missing part that really had me worried was the distributor caps. The Winton Model 148 uses dual distributors, and they are somewhat unique. Like almost anything on the engine, a replacement cap could be fabricated given enough time and money. What concerned me was that this would be another hang-up that would delay the operation of the engine indefinitely. I was stewing about this fact when on the Friday afternoon after Thanksgiving I took advantage of a few spare hours to get a little more time in on the Winton. The task I set for myself was installing the mounting bolts for the engine flywheel. These are specially machined for the purpose, and they are a very close fit in the crankshaft flange and are made with a shoulder. What this means is that I couldn't just slip the bolts in place by hand. Instead, I had to use the accompanying nuts to draw them down. This required some very large washers. Back to the boxcar I went to look for washers. On the shelf were various coffee-cans full of nuts and bolts and assorted hardware. I started pawing through the cans looking for suitable washers. Soon, frustration overcame restraint, and I dumped the can's contents out on the floor. There in the bottom of the can, hidden by an accumulation of nuts and bolts and sand, was the missing distributor cap. This meant that we had an original that we could match or copy, or at the very least, the engine could be run with just one cap. But the question now, how to find a matching replacement? Greg Gneier, one of our Associates and leader of our sister organization ASRA, mentioned to me that he thought he could contact a fellow who works for Jay Leno and makes parts for Jay's considerable antique car collection. Greg put in a call to Jay's office and waited. Some time later, Greg answered the phone at work. "Hi, this is Jay Leno..." said the voice on the other end of the line. It was Jay himself calling to offer his opinion that we should be able to find a replacement more easily than having one made, which he thought would be extremely expensive, and he referred us to Hemmings Motor News for sources. We were left speculating what "extremely expensive" might mean for us, let alone Jay. Hemmings yielded a firm in Grand Rapids, Michigan called The Burton L. Norton Company, which specializes in ignition parts for antique engines. After checking out their references, I sent them one of the distributors for evaluation. One fact that I had uncovered in my own research is that dual ignition systems were not uncommon on luxury cars of the day. Cadillac, Packard, Nash, and Stutz all had cars with two spark plugs per cylinder. Burton L. Norton Company told me that if their extensive search for distributor caps and rotors did not yield results, they would be able to provide two vintage Nash distributors suitably modified and tested. So whichever route we take, we seem to have a satisfactory solution. One other interesting note has been an ongoing discussion of fuel. When the motorcar was in service on the Santa Fe, it often ran with gasoline as low as 40 octane. I wondered if the higher octane of today's gasoline would be suitable. The purpose of octane in gasoline is to slow down and smooth out the combustion. This is why older cars with knocking engines run better on premium fuel with a higher octane rating. I spoke to a process engineer at Unocal, and he told me that in his opinion, the engine should run perfectly well on regular 87 octane gasoline. In fact, he thought it would run better than ever, without any adjustment to the timing. So that's another problem solved. Other helpers this quarter include Greg Ramsey, who assisted in putting on the rocker arm assemblies, and Alan Weeks, who put a fresh coating of Glyptal varnish on the inside of the valve covers. For the first time since I began writing this column more than five years ago, I have more to report on than will fit in the column. This means that you will just have to come out some Saturday and see for yourself! Goodbye, 1998. It certainly has been a good year for the Travel Town and her friends. Most momentous was the return of the Winton engine and the agreement that finally allowed us to start the Tail Track. Progress has been dramatic on the Winton. In fact, the reassembly of the engines is so close to being finished that Bryan makes a strong prediction in his article. However, you will have to read it there. A lot work continues outside the fence. Fortunately, the rains have been light so far, so a lot of dirt is being moved. Of course, a lot more still needs to be moved. A major obstacle, which has slowed us down, is also soon to be gone. An agreement has been reached to remove the Oil Rig near the service yard. It should be gone by the time you read this. In addition, we have had a lot of help, too. Over 70 volunteers from the Burbank High Key club descended on Travel Town. They attended to everything from pulling weeds and tearing out old fencing to mechanical and battery work on Charley. I understand that some were even pressed into service as car tour docents. Special thanks to Nancy Gneier for organizing all this and to Yvonne Ramsey for ramping up for 100 lunches with about 3 hours notice. The entrance project is still the most obvious project to the Park visitor. By year's end, the contractor, Guy Construction, appears to have finished all the concrete and block wall work and has installed the new bridge and entrance pavilion. By the time you read this, they should have also rerouted the miniature railroad around the Arcadia Depot. In addition to the above progress, Travel Town saw two new acquisitions this quarter. The first was a Railway Maintenance Corporation fixed wheeled Line Master track liner. This is a diesel-hydraulic powered piece of MW equipment used to align railroad track. It was donated by Cox Contracting of Council Bluffs Iowa, and transportation from Iowa to Arizona was donated by Road Warriors Trucking. My brother, Mike Ramsey, then drove to Phoenix with his pickup and a tandem-axle car trailer and brought it back to Travel town. Special thanks to Mike and to Bob Bennett for locating and arranging for its donation. The other new arrival was a former City forklift in working condition. It's a Mitsubishi FG-20 with capacity of 4,000 pounds, which makes it ideal for the majority of our needs. Special thanks to Councilman Ferraro and to Greg Gneier who arranged for its donation. In closing, let me thank all the associates who have become operating department instructors and all the associates, new and old, who have come out for training. With our new first weekend of the month schedule, we are going to need every one of you. Welcome, 1999! 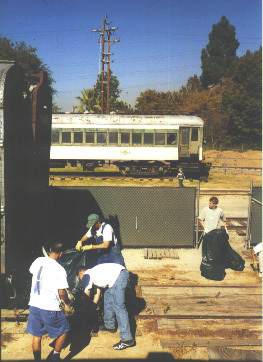 "SCSRA is a nonprofit California educational corporation that provides volunteers and assistance to help develop Travel Town into a world class railroad museum. Their plans include development of an interpretive center, an operating demonstration railroad, and docent guided tours for the enjoyment of City residents and visitors." These plans, of course, are the joint goals of SCSRA, ASRA and the Department of Recreation and Parks, and it is nice to hear them recognized in an official City document. 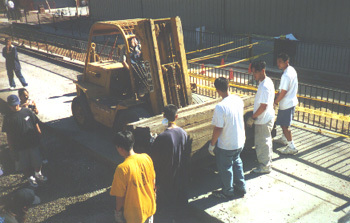 The donated forklift is a Mitsubishi model FG-20 in working condition. Its capacity is 4,000 pounds, which makes it suitable for the majority of our needs. We are grateful to Greg Gneier for spearheading the request, to Mr. Ferraro for recognizing our need, and to the City Council for voting to support the donation. The forklift arrived on December 23, and was put to work on December 26! Motor Pool - Jim Fontenot removed the fire truck body from the recently donated military truck and replaced it with a stake body which will increase its usefulness. We had originally accepted the truck since its fire truck body included a 400-gallon water tank, but we subsequently learned that this tank was too small to be useful to us. So, the truck, thus equipped with its stake body with removable sides, was used for the first time on December 26 to assist in moving many yards of dirt that had accumulated from the Track 6 to 7 Crossover Switch project. The "previously-owned" forklift arrived on December 23 (see "Forklift Donated" on this page) and was put to use on December 26 by the writer and Greg Gneier. Its 4,000-pound capacity enables it to move tie bundles and pallets of parts with ease. It is propane fueled and runs well. Let's keep it that way! 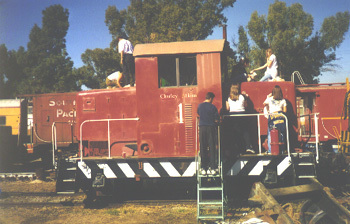 Cabeese - On November 21, as part of the Burbank Key Club's volunteer assistance (see more on this below), both cabooses' batteries were serviced under the supervision of Jim Vicars. Buildings, Equipment, and Grounds - In mid October ASRA and SCSRA received an interesting inquiry from the Burbank Unified School District. Would we be interested in helping students with community service requirements fulfill those requirements by offering them projects at the Travel Town Museum? We jumped at the chance! Having set October 24 as a target date, we made plans to accommodate two groups of 12 students. Dan Price made up signage directing the students to the Restoration Yard, Nancy and Greg Gneier confected hold harmless releases for the kids' parents to sign, and we assigned appropriate supervision. The day dawned bright with expectation, as we set up a special volunteer center to greet the kids. Well, no kids showed up. It seems that the school coordinator had dropped the ball. Accordingly, the special Saturday cleanup crew consisted of Nancy and Greg Gneier and Andy Evans. These wonderful folks did yeoman duty and filled several dumpsters, placed the lube oil drums on the containment pallets, cut up and placed scrap metals in the scrap bin trailer, and later in the afternoon helped on the track project adjacent to the Pennsy diner. As we reflected on the day's events, Nancy said that she would follow up with the Burbank school people and try to re-schedule a Saturday cleanup crew for November 14. Accordingly, on October 27 she met with Bill Scharsch of Burbank USD, and this resulted in further leads for community service volunteers from the Burbank USD including the speech and drama departments and the "Key Club." This latter group was invited to help on November 21. On November 14, we hosted 4 students from Burbank High School who assisted in Maintenance of Way activities and in ASRA activities. November 21, the big day, arrived filled with expectations. Anticipating a turnout of 70 or so Key Club volunteers, Nancy Gneier set up a welcome center just outside the Restoration Yard vehicle gate, and posted sign-in sheets for the various day's activities. The adjacent barbecue area was reserved for serving our usual volunteers' lunches. We were told that the student volunteers would bring their own lunches, but we were prepared to serve those who did not and various adult volunteers. 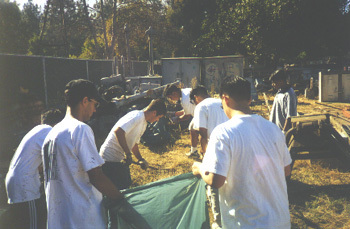 At 10 a.m., the invasion began and continued until we had logged in over 70 volunteers and 4 adult supervisors. It turned out that none had brought lunches, so Yvonne rose to the occasion and prepared and served nearly 100 hot lunches! Thanks, Burbank High Key Club! TT No. 1, "Charley Atkins," was cleansed of dirt and oxidized paint, waxed and polished, and the cab roof was painted. All equipment batteries were serviced. Significant amounts of paint were removed from the Pullman sleeper "Hunters Point." Major work was done on Track 6 from the crossover switch to the Pennsy diner. Major cleanup was accomplished in the Service Yard and in the Restoration Yard, with weeds removed and junk identified for disposal. The fencing behind the oil pump, the storage shed, and the gardener's shed was removed. Within the Exhibit Hall a team cleaned and polished the fire truck exhibits. 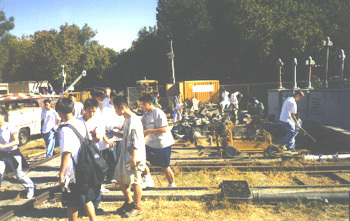 After the work sessions ended around 4 p.m., the student volunteers were given an opportunity to operate the handcar, which they all did most enthusiastically, yet without untoward incidents of any kind. SCSRA: Yvonne and Greg Ramsey, Joe Barilari, Jim Vicars, Bryan Reese, Andy Evans, Tim Dulin, Chris Rippy, Dan Price, Brian Moore, Jeff Barrow, John Daum, and Charles Forsher. ASRA: Nancy and Greg Gneier, Mike Marquette, and Brad Slosar. Travel Town Museum staff: Patrick Alonso, John Coghlan, and special thanks to Linda Barth for providing the required safety equipment. As those who attended will attest, the 1998 Holiday Party was loads of fun. With the exception of beverages in the cabeese, the entire evening was sponsored by the Museum as Linda Barth's way of saying thanks to all our wonderful volunteers. The dinner and beverages during dinner were catered by G.P. Recreations, the snack bar and miniature train concessionaire. Dinner included assorted veggies with dip, salads, finger sandwiches, pizza, quesadillas, and cookies. Following dinner, Linda thanked our volunteers for their year's work and spoke of the New Entrance Project nearing completion, the CS&CV RR now under construction, and the Train Shed which will begin next year. During the screening of Disney's The Great Locomotive Chase , Yvonne Ramsey's snack bar served fresh popcorn, drinks, and coffee. Many thanks to all who helped! The Diesel Shop is continuing to focus on the reassembly of the M.177's Winton engine. Much of our focus here has been on the one end or the other of the fuel system. We started the quarter trying to clean and reassemble the fuel return piping and surge tank, and ended the year by removing one of the gasoline tanks to clean it inside and out and prepare it for repainting. Charley began to exhibit anomalous behavior on October 31, and it continued into the first several trips of our November 1 operating day. It seems that the exciter field contactor, which should close when the throttle is advanced from idle, did not close and we were obliged to hold it closed as required. Within a short time, it acted normally again, but we needed to troubleshoot this problem. The exciter field contactor coil is energized by the throttle, but interlocked so that it will not close if the reverser is in "neutral," if the throttle is at "idle" or if the field switch is open. At 10:30am on November 7, Jim Vicars, Cliff Bornschein, Tim Dulin and Chris Rippy began to troubleshoot and simultaneously service the control stand and master switch box. The switch guilty of erratic behavior was found to be the throttle interlock, and Jim lubed and serviced it. In addition, the field switch in the master switch box was found to be loose. Tim disassembled the switch "stack" and re-mounted the field switch, and all switches were cleaned and lubed. Charley was up and running at 4:30 p.m., ready for training a brakeman class. The fuel pump motor, suspected of having one or more dead commutator bars, has not "acted up" during the quarter, so it will be addressed "next year." Charley's melodious 3-chime air horn had been loaned to us a long time ago, and the lender opted to take it back in late November, so we ordered a new Nathan P-3 air horn so that Charley would have a permanent "voice." The lender also took by mistake the adapter bracket that originally came with the engine, so Greg mounted the new horn on the cab roof, tested, and adjusted it on December 5. It is every bit as melodious as the loaned unit, and it is painted black to match the color of the cab roof. Meanwhile, Bob Bennett came upon a Leslie single-chime air horn that is a direct replacement for the horn that came with Charley when it was newly delivered to the U. S. Navy. Bob has donated it and it was installed on the original horn bracket while we awaited the delivery of the new Nathan. Should Charley ever be restored to his gray Navy livery, we may remove the 3-chime Nathan and connect the single-chime Leslie. The newly arrived diesel-hydraulic Track Liner, donated by the Cox Contracting of Council Bluffs Iowa, was trucked from its interim location near Phoenix, AZ, to the Museum by Greg & Mike Ramsey. On November 14, it was inspected and mechanical servicing began, including the replacement of some hydraulic hoses. During the following weeks, Bob Bennett, who had arranged the donation and its transportation to Phoenix by Road Warriors Trucking, completed cleaning of the liner and began working on changing all the filters and fluids. We are still working on locating appropriate repair parts for the hydraulic brakes. Once we have thoroughly checked over the liner, and repaired the brakes it will be turned over to the M/W Department. M/W Superintendent Joe Barilari will set up qualification procedures for operating the liner. 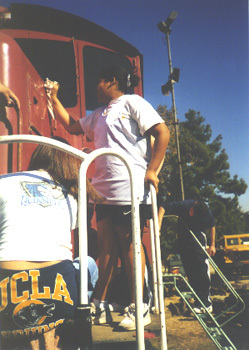 On November 21, as part of the Burbank Key Club's volunteer assistance, the batteries of both locomotives were serviced by club members under the supervision of Jim Vicars. Elsewhere in this issue you will read about a great clean-up day, November 21, and about a large contingent of Burbank High School student volunteers who made that day possible. We are grateful to these students and we sincerely hope that they enjoyed themselves (and the handcar operations at the end of the day) and that they will come again. Maybe a few will actually join SCSRA or ASRA. We are especially grateful to our group of "regular" volunteers who organized and supervised the clean-up activities. These Associates, who always rise to the occasion when called upon, are the very foundation of our organizations, and we thank them most sincerely. "Over the past few months, there has been a barrage of 'great ideas' that 'I' should do to help the Museum. On several occasions, people have suggested that 'I' should start working on their 'Great Idea.' While this (in principle) is not such a bad idea, you should have seen the expression on their faces when I suggested 'They' go work on their 'Great Idea.' What I am trying to say is that there are an abundance of 'Great Ideas' that can be acted upon.....but only if the person is interested in volunteering. "The Museum was founded by a group of railfans interested in sharing their passion for trains. Along the way, many people have come and gone. Some lost interest, some 'burned out,' some were 'turned off.' But new people continue to arrive at the Museum interested in our activities and express an interest to help. Matching these people's interest level with a 'Great Idea' project is a task that should result in a win-win situation. Some people have forgotten that the Museum is a group of VOLUNTEERS. "On the upside, yesterday the Museum received a letter from an 8th grade student in Wisconsin. He selected Railroading as a topic for a school paper. He sent a letter to the Museum asking about railroading in Arizona. I was quite happy to answer his questions and happy to see that there is still some 'youthful' interest in railroading. Helping people learn about trains and railroading is fun to me and something I feel is worthwhile." Once again we find ourselves at the close of a very good year in the Operating Department. Ridership and donations continue to increase, our small fleet of rolling stock keeps on rolling, and best of all, our ranks of trainmen continue to increase. With regard to the latter, we have three new Brakemen in our midst: Andy Evans, Nancy Gneier and Tim Dulin. In addition, Chris Rippy recently completed his qualification as Engineer and Instructor. Congratulations to all! As mentioned in last quarter's report, we are expanding our operations for 1999. Effective January 2, we will operate on the first full weekend of each month. This coincides with the first Sunday each month except when the first day of the month falls on Sunday. In that case, we move to the weekend of the first Saturday. In 1999 this will occur in August. Our public operations were held October 4, November 1, December 6 and the "Santa Fe Claus Express" on December 20. December 6 was bitterly cold and windy, and the counts for the day show it. And now for this quarter's salute to those who "kept 'em rolling:" Gordon Bachlund, Jeff Barrow, Bob Bennett, John and Margaret Daum, Steve "Santa Fe Claus" DeVorkin, Tim Dulin, Andy Evans, Mike "Oatmeal" Flaharty, Charles Forsher, Nancy Gneier, Jim Hoffmann, Dan Price, Greg and Yvonne Ramsey, Chris Rippy, Jim Vicars, Doug Ward and Alan Weeks. Thanks to all!
. . . Boyle Engineering Corporation of Newport Beach, CA, has graciously agreed to provide pro bono civil engineering design for the next segment of CS&CV RR construction from the end of the tail track to a point east of Los Angeles Live Steamers, for which the SCSRA is most grateful. This design includes the tricky crossings of the LALS scale railroad tracks under the CS&CV RR main line to the Zoo. Boyle's Greg Crews visited the site on January 7 and met with Linda Barth, Tom Breckner, and SCSRA Project Manager Greg Gneier. Over the next several weeks, supporting engineering data were identified and provided, including crossing elevation recommendations by LALS, enabling Mr. Crews to lay out an optimum route consistent with our criteria for grade and curvature. This work will be ongoing for the next monthor so.
. . . the SCSRA's website is a result of the efforts of Kevin Tam who began it and Sue Kientz and Ted McConville who expanded it and maintain it. However, I wonder how many of our regular readers have ever bothered to visit it. The address, which is shown on the masthead on the back page, is http://www.scsra.org. In addition to regular updates of Bryan's progress on the M.177's historic Winton engine, with digital photographs in full color contributed by Greg Ramsey, each issue of The Headlight is uploaded so that web browsers interested in our work can look in at any time. As of this writing, over 16,500 people have logged on to the site. We even have a membership application that can be downloaded, and several people have printed it and mailed it with their checks. If you have Internet access, look up our web site. I think you'll be pleasantly surprised!
. . . why the Association sponsors Movie Nites? For entertainment, of course, and to screen films which, for the most part, feature trains, since Hollywood has used trains in films since 1903! However, an editorial by film historian Peter Cole offers another explanation which I would like to share: "There is a place for television in our lives. There has been since Milton Berle first appeared in 1948. But, movies are made to be experienced, not simply observed. When one watches a film on television, whether from a tape, disc or even a DVD, there is a distance between the action on the screen and the audience. However, when the lights of the room dim and the beam of the projector hits the big screen, that distance no longer exists. The observer becomes the participant. In that lies the magic of movies. Those of us who enjoy, and, indeed, revere this experience, know with an absolute certainty that there is no comparison. TV dinners were invented in the 1950s. They were economical and fast. In no way did they offer competition to a home-cooked meal or one served in a fine restaurant."